Deteriorating consumer confidence and economic uncertainty due to the European sovereign debt crisis and the growing likelihood of a protracted period of slow growth in developed economies is placing further pressure on the world’s airlines and their investors. Airline share prices have taken a battering amid concerns the world is re-entering a recession and on weaker earnings expectations, according to IATA. Jet fuel prices, while down from their Apr-2011 peak, continue to pressure the sector, while a slowing in travel volumes and falling freight demand are also of concern. IATA, in its Aug/Sep-2011 Airlines Finance Monitor, stated airline share prices, measured using the Bloomberg Global Airlines Index, are now down 32% so far this year, compared with a 14% fall in the FTSE Global All-Cap index. 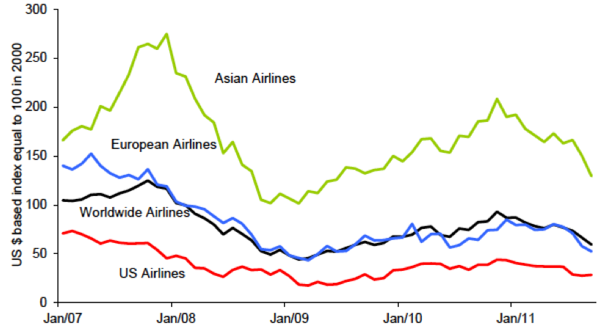 Asia-Pacific airlines were hit hardest in Sep-2011, with US airline stocks the least affected. While equity markets in general have declined on a worldwide basis in Sep-2011, “airline stocks were marked down more than other sectors, as financial markets judged airline profits would be hit hardest by deteriorating economic conditions”, IATA said. 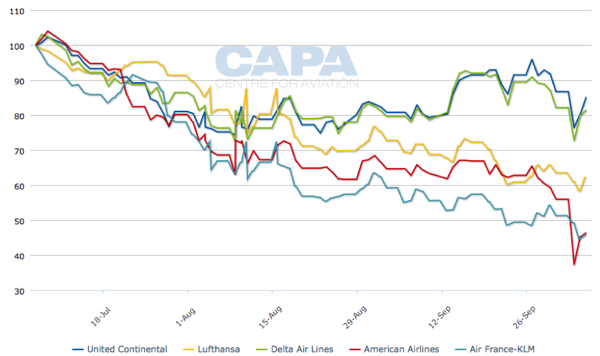 According to CAPA’s Share Price Analyser, the world’s five largest carriers by system capacity (ASKs) levels – Delta, American, United, Lufthansa and Air France – have all witnessed significant share price declines in 2011. American Airlines parent AMR Corp (AMR) shares slumped 33% on 03-Oct-2011, the most since 2003, with declines of as much as 41% to USD1.75, triggering automatic trading halts, on growing concern the carrier would be forced to seek bankruptcy protection. On the same day, United Continental Holdings shares declined 12% to USD2.27, US Airways Group shares slumped 16% to USD 4.63 and Delta Air Lines shares weakened 11% to USD6.65 on heavy volume (throughout the day, 32.8 million shares of Delta Air Lines exchanged hands as compared to its average daily volume of 15 million shares). The Bloomberg US Airlines Index, which tracks 10 US carriers, declined 35% since 19-May-2011. In Canada, Air Canada shares have tumbled 61% to CAD1.33, while WestJet shares have weakened 11% to CAD12.46 since the beginning of 2011. In Europe, Air France shares sank 9.1% on 04-Oct-2011 to EUR4.8, its lowest price since at least Dec-1991. IAG shares have lost around 40% of their value in the last three months and slumped this week in reaction to reductions by its trans-Atlantic partner, American Airlines. Flybe, meanwhile, declined 36% to a record low of GBP0.65 after the regional airline reported a significant slowdown in sales during Sep-2011. Its shares have lost 78% of their value since its IPO last year. In Asia, shares in Qantas have slumped 46% since the start of the year amid a deteriorating economic climate and a damaging stand-off with unions. The stock closed unchanged at an all-time low of USD1.375 on 05-Oct-2011. In China, China Southern shares declined 6.3% to HKD3.45, China Eastern witnessed a 9.7% share price slump to HKD2.24 and Cathay Pacific shares weakened 3.9% to HKD12.30 on 03-Oct-2011. In India, Kingfisher’s shares were severely weakened after last week's announcement it would exit from the low-cost segment. Its shares fell by over 20% in three days following the announcement. From a sample of 54 airlines across all regions for 2Q2011, IATA noted that 2Q2011 net profits have totalled USD2.3 billion and operating profits USD4.0 billion. This marks a 43% year-on-year reduction at the operating levels and a 37.3% reduction at the net level (although this is improved from the 60% decline reported from its previous sample of 33 airlines in the Jul/Aug-2011 monitor) and the first decline in eight quarters. “The largest decline, particularly at the EBIT level, has been for the Asia-Pacific airlines, hit hardest by cargo weakness. North American airlines have also seen a significant squeeze on margins. By contrast profits improved for European airlines. Good performance on passenger markets has helped. But also the comparison is with the depressed volcanic-ash-affected Q2 of 2010,” IATA said. IATA, in its most recent financial forecast released on 20-Sep-2011, forecast the aviation industry will see total industry profits fall from USD6.9 billion in 2011 to USD4.9 billion in 2012. IATA Director General Tony Tyler has also subsequently cautioned that airline profits forecast to total USD28 billion in the three years through 2012 may be unsustainable as over-capacity and looming regulatory costs weigh on margins. This will create an average net margin of only 0.8%, which could weaken even further if economic growth slows to less than 2.4%. In a slight reprise for the world’s airlines, jet kerosene prices have continued to trend downwards from their peak in Apr-2011 over the past month to now be USD20/barrel below these peak levels at just over USD120/b. However, prices are still USD30/b or more than one third higher than last year and continue to remain volatile, with IATA noting that they are “swinging +/- 10% around that downward trend”. 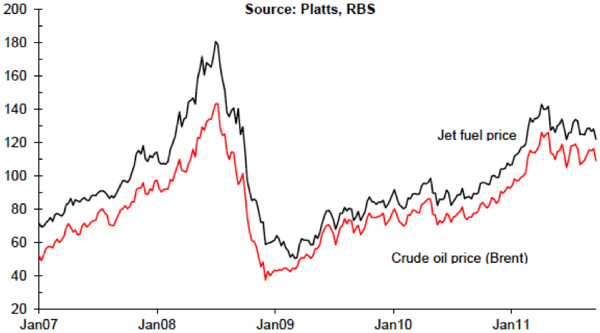 According to Platts data utilised in IATA’s jet fuel price monitor, jet fuel prices in the week commencing 30-Sep-2011 stood at USD122.1/barrel, a 29.9% year-on-year increase but a 6.9% month-on-month decline. IATA estimates an average jet fuel price of USD127.6/b in 2011, for an additional fuel cost of USD60 billion compared to the 2010 total. 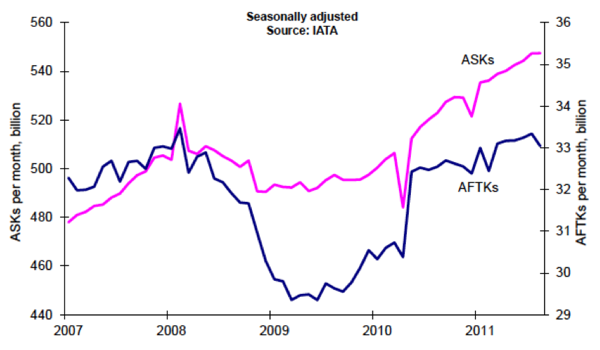 Looking into 2012, IATA expects fuel prices to decline, but to remain above USD100/b. Every USD1 increase in the price of Brent crude adds USD1.6 billion to industry costs, IATA has said. The rising price of oil means that fuel will account for 30% of industry costs this year, compared with 13% a decade ago. 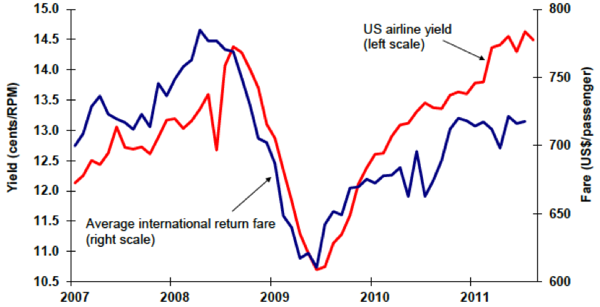 Passenger yields, at least for US airlines, are now back to pre-recession levels and have increased by around 10% on international markets in 2011, as tight supply-demand conditions have allowed US airlines to react to rising fuel costs in their pricing. IATA added that breakeven load factors have “probably been kept stable” for these airlines. Yields have been “not so strong” outside the US and are falling in freight markets. “Freight markets are increasingly challenging with falling yields and still high fuel costs increasing break-even load factors. Falling actual load factors will be putting significant downward pressure on profitability,” IATA said. IATA stated additional deliveries of new aircraft (104) and aircraft brought out of service (net 39) added 137 to the in-service fleet, adding 0.7% to the number of seats in the fleet. “If continued at this pace all year this would expand seats by over 8%” IATA noted. IATA also cautioned that “there are signs of a potential capacity issue in the recent decline of twin-aisle aircraft utilisation”. As previously reported, Aug-2011 saw a decline in both air travel and freight volumes, as economic conditions and business and consumer confidence has deteriorated. Passenger market capacity reasonably matched demand, with yields sustaining breakeven load factors, although load factors are beginning to slip amid weakening demand. 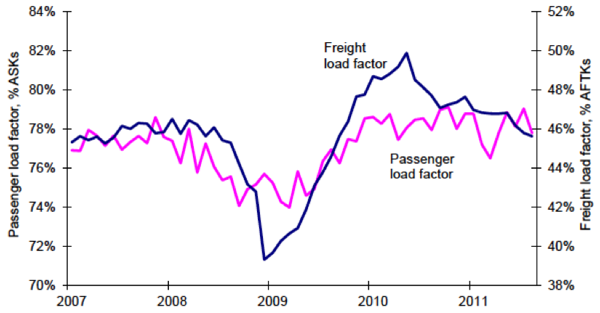 The freight market situation materially worsened with rising breakeven but falling actual load factors. 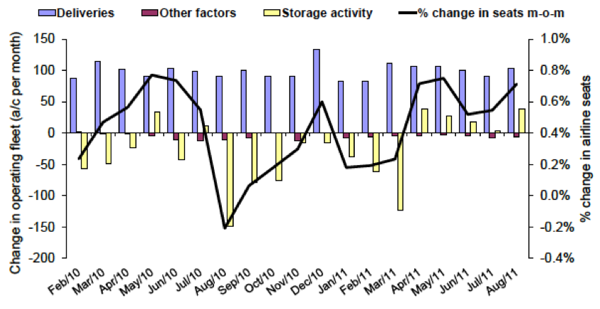 The Aug-2011 traffic results, weaker 2Q2011 profitability and the caution about the remainder of the year indicate the challenges ahead and the continued uncertainty existing in the aviation industry. Mr Tyler earlier this month commented that “The natural condition of the airline industry is crisis. Occasionally, we’ve had short periods where the conditions are quite benign and everything goes quite well, and the danger is to believe that’s normal – and that’s wrong”. Meanwhile, the current weakness in freight traffic foreshadows an expected weakening in passenger markets, as do “falls in business and consumer confidence, the unresolved financial situation in the Eurozone and the stagnation or worse in world trade”, which are all likely to weaken air travel and air freight further, IATA said. According to The Conference Board, the “severe deterioration in business confidence and stock prices” in the euro zone has continued in Sep-2011. “The sovereign debt crisis and the uncertainty concerning its resolution are beginning to dampen current economic activity and the immediate outlook. The prospect of a banking crisis and increased fears of recession are self-reinforcing and an economic contraction cannot be ruled out in the very near term,” it warned. In the US market, The Conference Board separately noted “the pessimism that shrouded consumers last month has spilled over into Sep-2011”. Consumer expectations, which had plummeted in Aug-2011, remained weak in Sep-2011, with consumers’ assessment of current conditions declining for the fifth consecutive month, “a sign that the economic environment remains weak”.